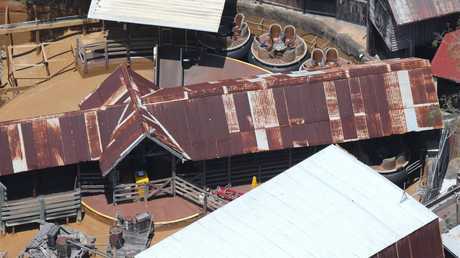 THE deadly conveyor belt on Dreamworld's Thunder River Rapids ride had problems 'right from the word go', an inquest has been told. Giving evidence on Wednesday in to the 2016 deaths of tourists Kate Goodchild, Luke Dorsett, Roozi Araghi and Cindy Low, former Dreamworld mechanics described frequent breakdowns and mechanical issues for the conveyor belt stretching back virtually to the ride's inception in the 1980s. Workplace Health and Safety Queensland inspectors have told the inquest of their belief that a decision to remove two out of every three wooden slats was a major contributing factor in causing a raft full of passengers to flip on the day of the tragedy. Former maintenance controller John Angilley told Coroner James McDougall the decision to remove slats from the ride was made by superiors to reduce the weight on the chain operating the conveyor up to 30 years ago. "We had to continuously replace sections of the chain," he said. "The conveyor right from the word go used to trip (because of the weight). "So to reduce the weight on the conveyor (it was decided to) remove some slats and put in some smaller slats. "I think they considered it was sufficient to take out two planks and still have enough surface to carry the rafts up the conveyor." A WHSQ report concluded the doomed raft got wedged in the gap between the slats after colliding with a stationary raft, causing it to suddenly lurch up on its axis.